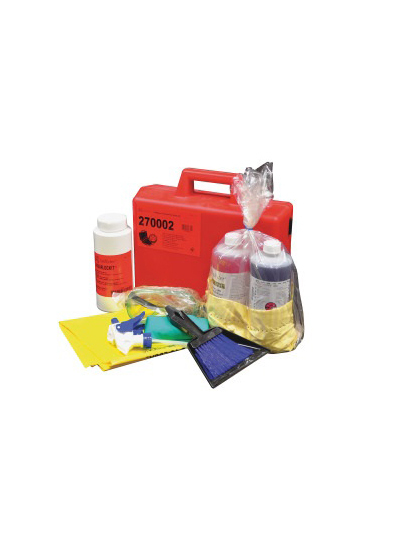 This compact Spill Kit includes everything needed in order to handle a small spill involving acids or bases. Evacuate employees from the spill area. 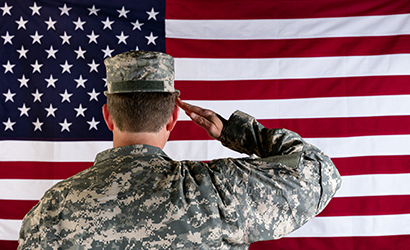 Wear personal protective equipment compatible with chemicals involved. 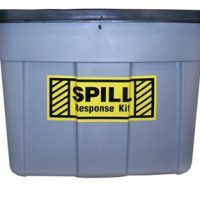 Contain the spill with universal sorbent material. For best results place universal sorbent pads on the spill to soak it up. Slowly spray or pour the base neutralizer on the spilled caustic. CAUTION: Some HEAT or GASSING OUT may be generated. The color change indicator changes from RED to BLUE during neutralization. Color change must occur. Apply liquid base neutralizer until the color change indicator first turns a yellowish color. Do Not Over-Neutralize. 3. Allow neutralized liquid to cool. Soak up remaining neutralized liquid with sorbent materials. Place used sorbents into temporary disposal bags. Wipe up residue with non-woven cloth material. Dispose of all used articles (sorbents, neutralized liquid, etc.) according to local, state and federal regulations. NOTE: Depending on the extent of the clean-up process, additional equipment may be required. CAUTION: Do not use KOLORSAFE® Liquid Base Neutralizer on any solution containing (in any form) metallic nitrates, cyanides, sulfides, strong oxidizers, or hypochlorite (sodium or calcium) solutions since dangerous gases will be generated. Slowly spray or pour the acid neutralizer on the contained spilled acid. CAUTION: Some HEAT or GASSING OUT may be generated. The color change indicator changes from PURPLE to YELLOW during neutralization. Apply liquid acid neutralizer until the color change indicator first turns a reddish color. Allow neutralized liquid to cool. Place used sorbents into temporary disposal containers. 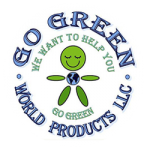 Dispose of all used articles (sorbents, neutralized liquid, etc.) according to local, state and federal regulations. NOTE: Depending on the extent of the clean-up process, additional equipment may be required. Evacuate employees from the spill area, if necessary. 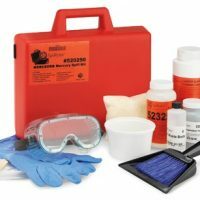 Determine if the contaminated water, sludge, neutralized acids or bases, etc. are pH neutral (pH 6-7). Sprinkle some of the AQUALOCKIT® onto the neutral spill. Allow the AQUALOCKIT® to absorb the pH neutral liquid. Collect the used AQUALOCKIT® by sweeping, vacuuming, shoveling, etc. Place the used AQUALOCKIT® into a temporary disposal device. Dispose of all used articles according to local, state, and federal regulations. NOTE: AQUALOCKIT® Solidifier will not gel spills that are not pH neutral.